The smallest of all Audis, smaller than the recently introduced A1, the Audi A2 was never sold outside Europe. Launched at the Francfort motor show in 1999, it was a high-tech city car with an aluminium body, luxurious equipment and efficient diesels with unit-injectors. All that made the little Audi expensive, and the A2 never attracted many customers. Audi discontinued it in 2005, and it hasn’t been replaced yet. But used A2s are now very much looked after by electric car fans or some tuners, because their aluminum construction and aerodynamic body give them a great asset if you plan to convert the car to electric drive: the lightweight body will help offset the added weight of a large battery pack. That’s what the people from DBM Energy thought (among others). They have developed a new and very performing battery cell, with Lithium-Metal-Polymer technology. That’s like the Batscap battery the French Bolloré group is planning to use in its much expected Bluecar. I shall add that it’s different from the lithium-polymer cells you can find in Apple iPhones and iPads, because those cells have their anode made of carbon, and we’re talking metal here. DBM first tested its cells in forklifts, and they have established a record, with a 32-hour non-stop operation. Their next move, logically, had to be with a motorcar. 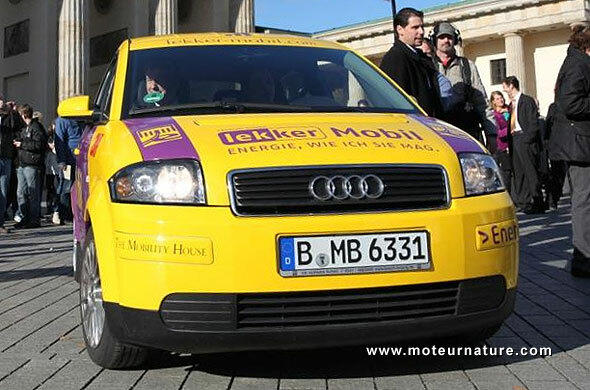 They chose an Audi A2, without asking anything to the manufacturer, and the car has been extensively modified by themselves, with a bit of help (mostly financial) from lekker Energie. The car has been kept the way it was, in a sense that it’s still a four-seater, and there’s a trunk. I mean that, they didn’t simply fill up all the back of the car with batteries. Some Japanese guys did that on a Daihatsu, and that was how they managed to drive 625 miles without recharging. The car was full of batteries, and a team of drivers drove at a sleepy 22.7-mph average. The Germans wanted to do it better. The car they would use would be normal-looking, and fully functional, with a heater and air conditioning. Most important, they would drive at normal road speed. That’s what they did, from Munich to Berlin. 366 miles according to Google maps. They did it in barely 7 hours, driving 376 miles. What’s really incredible is that to avoid traffic, they drove by night, so the lights were on, and the heater too! These guys must know something I don’t! I was not expecting such a record to happen before at least 2015. But it’s real. If you speak German, you may check this video. 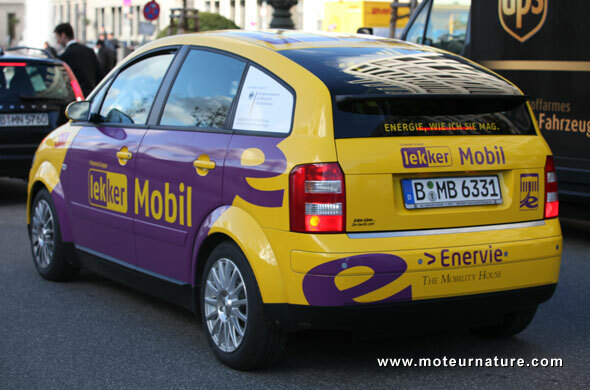 There’s also a website dedicated to the event, and members from the German government were at Berlin to greet Mirko Hannemann, the driver, and head of R&D at DBM Energy, after his trip.